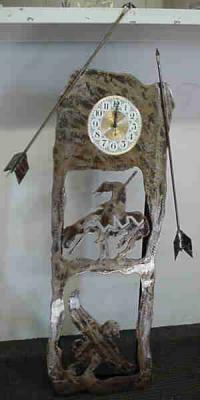 This clock was a custom design by one of the fellows that works with me in a sheet metal shop. Many of our guys are extremely talented and artistic. They work hard for a living, using their hands to make everyday products that no one ever really notices, yet they can and do create some of the most beautiful art when given a chance. Since we are in the Southwest of the United States, Indian and Kokapeli design is quite popular. We were able to scan the image into the computer and digitized it. Although this sounds simple it is quite a process. The lines must be configured in such a way that only the negative parts of the pattern are cut away. The burn marks and lead in holes must be moved to the negative areas. Just the configuration of the drawing took several hours. Another fellow then cut the steel on our plasma table. It is made out of 1/4" black iron. The arrows were handmade by our foreman. The clock was then textured, a rusting compound was applied and the whole thing was then sealed. The total time involved to create this clock was 25 hours, from inspiration to completion. After assembly, we raffled it off at our annual Christmas BBQ and all the proceeds were donated to St. Mary's Food Bank. We were able to raise several thousand dollars to help feed the hungry here in Phoenix, AZ. This clock will always be a reminder that the time to lend a helping hand is now. Yes, I won the raffle and the clock is proudly displayed in our company office as a reminder to all of us what we can and must continue to do.